Rated PG. Parental Guidance Suggested. This is a Bollywood Entertainment brand of the Hindi DVD. Has no UPC Code. Color. Full Screen. Dolby Mono Sound. NTSC FORMAT. HAS ENGLISH SUBTITLES. 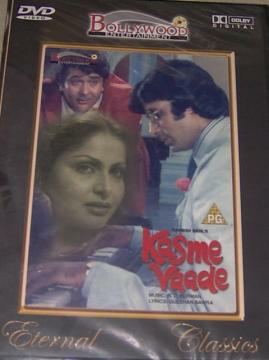 Ramesh Dehl's KASME VAADE. Music: R. D. Burman. Lyrics: Gulshan Bawra. Starring: Amitabh Bachan, Rakhee, Neetus, Randhir Kapoor, Amjad Khan. Release Date: Apr 20, 1978 (India). Buy Kasme Vaade (DVd, 2000), sold & shipped by Movie Time Video where you can shop online for Pooja Mandir, Bajot, Gifts, Hindi Movie DVD / CD, Music Video. This Amitabh Bachchan Film collection has been tagged as BI 1 NEH 7.00 14.93 amitabh bachchan rakhee neetus randhir kapoor amjad khan.